"A long time ago in a galaxy far, far away...." Come join the epic battle as Jedi Knight, Sith Apprentice, or anyone in between. You will find costumes from ALL the Star Wars Films: Episode IV: A New Hope, Episode V: The Empire Strikes Back, Episode VI: The Return of the Jedi, Episode I: The Phantom Menace, Episode II: Attack of the Clones, Episode III: Revenge of the Sith, and The Clone Wars. Our Anakin Skywalker Costume is one of a kind from Star Wars. The Anakin Skywalker Costume includes the tunic, pants with attached boot tops and belt. It comes in Adult Standard and X-Large Size only. Our Deluxe Clone Trooper Costume features a Clone Trooper jumpsuit with EVA molded pieces, and mask. Our Deluxe Jango Fett Costume is another favorite character from Star Wars. Our Emperor Palpatine Latex Hands are authentic white, wrinkled and scarred gloved hands are made of latex and measure 11 inches long and 5 inches wide across the palm. Our Deluxe Darth Vader Costume is another favorite character from Star Wars. The Deluxe Darth Vader Costume includes the Helmet/Mask, cape, belt, jumpsuit with molded EVA collar, chest piece and boot tops. Our Deluxe Emperor Palpatine Costume includes a maroon robe with a hood which is a mixture of polyester and velvet. The robe secures together behind the neck. Our OBI-Wan Kenobi Costume is a likable character from Star Wars. The OBI-Wan Kenobi Costume includes the Tunic, pants with attached boot tops and belt. It comes in Adult Standard and X-Large Size only. Our Yoda Latex Hands includes a pair of green latex character gloves with three fingers, and long fake nails. One size fits most adults.This is an officially licensed Star Wars Clone Wars product. Our Yoda Latex Mask is a full overhead mask. Our Yoda Latex Mask full vinyl mask is complete with inset wrinkles in all the right places and has perfectly formed features for added authenticity. Our Anakin Skywalker Clip on Jedi Braid is a plaited braid of some 6" long which attaches to hair with small clothes peg clip. Our Jedi Deluxe Hooded Robe Costume is authentic. The Jedi Deluxe Hooded Robe Costume is an officially licensed Star Wars product. Our Deluxe Princess Leia Costume is another favorite character from Star Wars. Our Darth Vader Supreme Costume from Episode III - Revenge of the Sith, is an incredibly accurate recreation of the costume worn in the movie. The Supreme Edition Chewbacca Costume includes the body suit and is completely covered with hand layered multicolored long hair fur for an authentic blended look. Our Jedi Costume is a likeable character from Star Wars. The Jedi Costume includes the printed tunic, pants with attached boot tops and belt. It comes in Adult Standard Size only. Polyester. Standard fits up to size 44. Our Darth Vader Costume From Star Wars comes in sizes Newborn, Infant and Toddler. 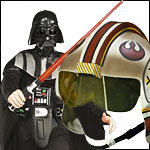 Our Darth Vader Costume From Star Wars includes the headpiece and romper with detachable cape and inner snap closure. Our Supreme Edition Darth Vader Mask and Helmet is made in heavy injection molded ABS material, cast from the original Lucas Studios molds. Our Deluxe Adult Chewbacca Costume include the full fur Jumpsuit with attached boot covers, Full Deluxe Vinyl Mask and cheat sash with pouch. Our Darth Vader Lightsaber is a great addition to any Star Wars Jedi costume! Not only does it light up so it looks like a real lightsaber, but it also extends to over 3 feet in length! Our Luke Skywalker Lightsaber is a great addition to any Star Wars Jedi costume! Not only does it light up so it looks like a real lightsaber. Our Obi-Wan Kenobi Lightsaber is a great addition to any Star Wars Jedi costume! Our R2D2 Costume From Star Wars comes in sizes Newborn, Infant and Toddler. Our R2O2 Costume From Star Wars includes the headpiece and the robe. Our Star Wars Deluxe Luke Skywalker Adult Costume is another favorite character from Star Wars. This is the officially licensed Star Wars Han Solo Deluxe Halloween Costume. Our Deluxe Han Solo Star Wars costume includes the shirt with attached vest and pants with attached boot tops. Our Star Wars Jedi Super Deluxe Costume Robe is a dark brown, floor length robe made from Polyester. It comes in Adult Standard Size only. This is the officially licensed Jedi Super Deluxe Costume Robe from Star Wars. The Luke Robe is the perfect fantasy jacket to wear to your favorite LARP or Comic-Con convention. Also excellent for medieval - Renaissance period events it will complement most every costume. Made from textured cotton.